From left, Peoples’ Self-Help Housing President/CEO John Fowler, PSHH Development Director Rochelle Rose CFRE, Pacific Western Bank Executive Vice President and Regional Manager Tom Strait, and PW Vice President and Senior Relationship Manager Carl Dudley. 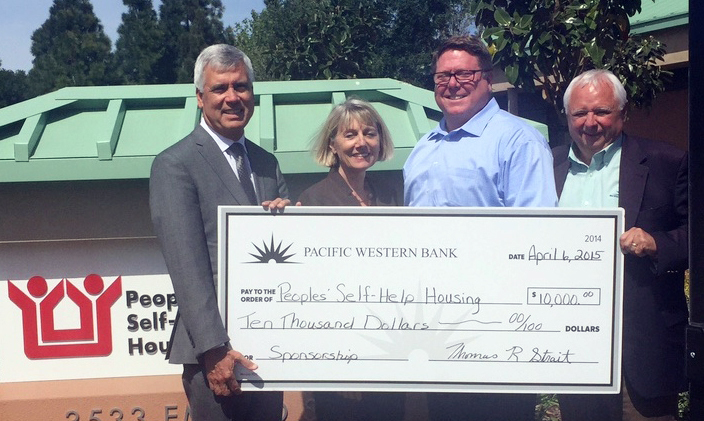 Central Coast, May 5, 2015 – Pacific Western Bank recently presented Peoples’ Self-Help Housing with a $10,000 check in recognition of the award winning nonprofit’s 45th Anniversary in 2015. A small group of community leaders founded Peoples’ in 1970 to address the lack of safe, affordable housing in San Luis Obispo, and the nonprofit has since expanded to Santa Barbara and Ventura counties.